Choose almonds and you get a Superfood that delivers super results, including natural cures to major dis-ease. Superfoods are whole foods found naturally in nature - preferably organic and raw. A hand-full a day assures wellness in many areas. and add nutrition (vitamin e) and natural oils that reduce the signs of aging like wrinkles and sagging skin. Health is a choice you make every day - with every bite you eat. Can almonds save your life? Heart disease is the number one cause of death in the United States. Studies involving more than 220,000 participants show that diets that include a handful of almonds a day help significantly to reduce the risk of heart disease, the leading killer of both men and women. Almonds saved the lives of over half those studied. Why? Because raw almonds contain powerful antioxidants and anti-inflammatories and heart disease is an inflammatory condition. Health and maintaining wellness is a choice you make every day, with every meal and snack you eat. Superfoods, like almonds, are foods that have been used for centuries for their nutrition and healing properties. Almonds originated in Central Asia, growing wild along the ancient Silk Road trade route. Merchants traveling between China and the West traded and used almonds themselves, spreading them throughout the ancient world. Almonds grow in a hot, arid climate and spread into those climates in the Middle East to Northern Africa and around the Mediterranean. Almonds are a fruit in the "plum" family. Ancient cultures carved symbols in stone, on temples and on pottery. They considered the almond a fertility gift from the Gods. The Romans gave them to newlyweds to ensure large healthy families. Almonds have been grown in southern California over 100 years, and are a major crop today. Native natural diets point the way to healthy eating, providing nutritious, low calorie, and high protein staples - with curative properties too. It is only recently that the new scientific discoveries show what your ancestors knew to be true. Superfoods have the ability to sustain your energy and restore your health and vitality daily, but especially after an illness or physical set-back. Did you know that it only takes a handful a day (about 2 ounces) to lower your risk of heart attack and diabetes? The almond fruit is inside the casing. Organic and raw are the healthiest choice. That is if almonds are your primary source of fat. The healthy choice is to cut out all other fats (but olive oil) and replace them with almonds. Many studies in the last fifteen years show exactly how almonds are beneficial. Some of the results - like weight loss - were not expected. The monounsaturated fats in almonds begin lowering your total cholesterol within a week or so. More important - they also lower the LDL cholesterol, or the "bad" cholesterol that is harmful to your heart, arteries and immune system. Almonds also lower your risk for gallstones. By lowering total cholesterol, they help the body to control the amount of LDL cholesterol that enters your gallbladder. That lowers the risk of cholesterol crystallizing into gallstones. and let thy medicine be food." Make almonds your 'snack of choice.' Only a half-cup can return amazing health benefits naturally. In several studies almonds lowered heart problems by more than 50%. It's a natural cure that works - better than expensive supplements, that may not even be absorbed into your body's system. If you eat between one and three ounces, several times a week, you can lower your total cholesterol and LDL cholesterol: Without lowering the HDL, or good cholesterol. 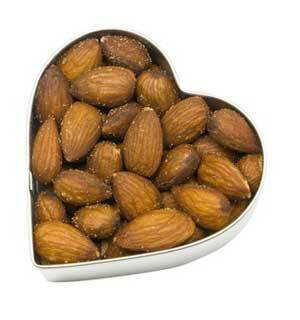 Eat organic nutritious almonds instead of the fats now in your diet (like fried food, dairy and dressings.) You'll reap the benefit of lowering your cholesterol and risk of heart attack. The nuts tested in the studies were raw and unsalted -- not roasted in oil and salted. The researchers also found a surprise benefit. Unexpected weight loss resulted, even though the participants were consuming nuts several times a week Participants did not gain weight and some were actually losing pounds. It turned out that the small amount of nuts eaten during the study were so filling that they craved, and therefore ate, fewer of their usual high-fat snacks like fried foods and chips and dips. almost half the RDA and absorbed by your system. a potent antioxidant which helps prevent the fatty buildup in the arteries. and assists with the absorption of calcium. The thin brown coating is rich in antioxidants -- reducing the risk of heart disease. Raw organic almond butter can be substituted for almonds. For some almonds are a mood enhancer and improve emotional stability. There are no side effects except for those with food allergies to nuts and legumes. 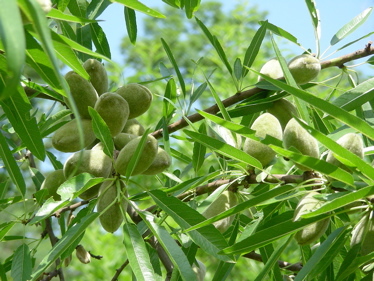 Almond oil has homeopathic and cosmetic applications. Edgar Cayce recommended almond oil as a natural cure. Almond extract is made from the oil of the bitter almond variety. The oil is diluted with alcohol (or water) and is a very potent flavoring. 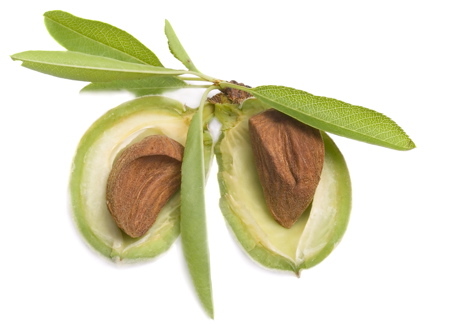 The largest is the Jordan almond is grown in Spain where the growing conditions produce unusually large fruits. Eat Almonds: avoid expensive dangerous drugs and costly miserable diseases! Organic and raw are the nutritional choice. Begin today - modify your diet. Why take the chance? Reverse your body's circulation build-up or your heart's vulnerability to disease. "What makes me so certain that the natural human lifespan is far in excess of the actual one is this. Among all my autopsies (and I have performed over 1000), I have never seen a person who died of old age. In fact, I do not think that anyone has ever died of old age yet. We invariably die because one vital part has worn out too early in proportion to the rest of the body." Aging does not mean decline. No one dies of aging - they die of stress induced dis-ease that finally wears down an important body function. Heart disease is the number one killer: Your diet is the cure. Indulging in stress is the culprit behind dis-ease. All death is suicide - albeit slow - it is a choice. It only takes half a cup of almonds a day to make a BIG difference. Build a healthy habit starting today. Increasing blood flow helps to unclog the arteries. The amino acid helps to prevent deposits of cholesterol in the arteries. 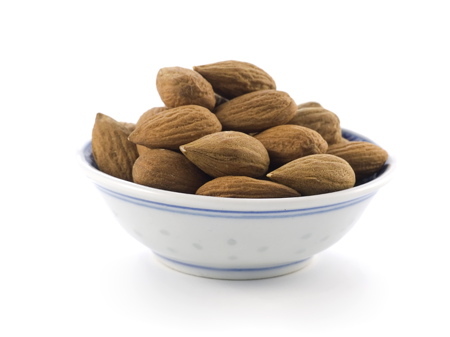 Other foods, like red meat and dairy products also contain arginine, but almonds contain more. Almonds have about 3 grams of arginine per 4 ounces. Beef cuts like top sirloin, measure less than two grams for the same quantity. Unless the meats are organic, other toxic hormones and pesticide residue in the fats cancels out the benefit of arginine. Almonds are a perfect "travel" food and a great quick convenient snack Organic almonds are naturally preserved by their "shell" for long storage. Shelled almonds keep fresh in the refrigerator in sealed containers for months. Organic is worth the cost as some sprayed pesticides and fungicides are "systemic." That means the poison is infused into the tree and soil, ending up in the "fruit." Include heart-healthy almonds every day - here's how. Add almonds to cereal, fruit or add raw organic almond butter to toast in the morning. Add almonds to sandwich "fillings" and salads, to soups and stews. Blend up a fruit or veggie smoothie and add almonds. Add to ice cream or to granola and top pancakes or french toast. Cook with almonds for the taste, but heat destroys most of the nutrients. Add almonds to rice pudding, pies, cookies and cakes. Health and vitality build with every meal - and you choose fresh every day. Changing diet habits and favorite snacks is tough - only because the craving is a habit. If you have a habit that is limiting your energy - and even your life - it's worth it to make the changes, isn't it? In 21 days you can set a new habit - and build your future on a healthy, happy body. Following a plan makes it easy to do. Add almonds together with the Health and Wellness guidelines. Your body is the only one you got - might as well take care of it! What's all the talk about Superfoods and what works? A Quick Good Fortune Insight: Fruits, nuts and vegetables afford many, many health benefits - and each has something unique they contribute to a healthy diet. Everyone selling a product finds the benefits and then claims "superfood" status. That dilutes the concept - once everything is "super" - then nothing stands out. Superfoods are a natural whole food. There are some foods like almonds, honey, dates and green tea that are on every "superfood" list. Some foods are cured or treated to be edible, including olives and olive oil. These are all ancient treasures. Cultures relied on them for survival, health and nutrition - and on their curative properties too. can instantly build energy and clear your mind. Raw honey and pollen contain all essential minerals, B complex, amino acids, enzymes; and can prevent cancer and Alzheimer's. Try this natural cure for allergies or the traditional home remedies including cinnamon. Begin with a natural remedy and make natural health and wellness your lifestyle. In addition, there are some foods that have recently been proven to also provide a wide range of benefits, including blueberries, Acai, tomatoes, and turkey. 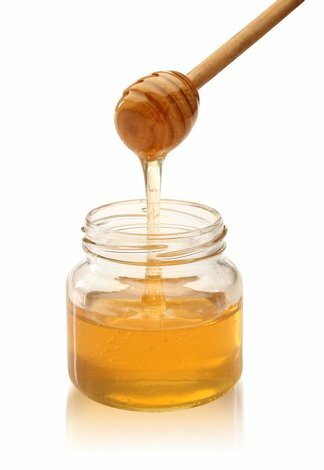 Honey is possibly the oldest natural remedy -- well know as a cure for many ailments. "RAW" and not pasteurized (forget the honey bears) has the nutrients you need. Some foods lower or help regulate blood sugar levels -- necessary in our sugar-rich society. Balancing blood sugar helps slow the aging process, wrinkles; and prevents diabetes, obesity and related degenerative diseases. You don't need specific Superfoods for specific ailments. A healthy diet incorporating a variety of Superfoods, fruits and vegetables helps to maintain your weight, fight disease, and prolong your life. Test out a Superfood like almonds for a month and see how it feels and works with your system. Keep in mind that your old habits will dominate for 21 days, and you cannot make a good mindful choice until you have built a new healthy habit. Only then can you see how much it adds to your overall wellness or well-being and health. Follow your own inspiration and see what works best for you. Articles, tips and strategies to enjoy a healthy, active life. The Mediterranean Diet is a Natural Cure and a natural defense against aging rapidly, heart disease, cancer, and Dementia. Once your body gives out and the symptoms are critical it's too late to make easy diet changes that can help you much. Why not start now and eat your way into a healthy lifestyle? It's a lot less trouble and expense to switch your diet than suffer through disease, the dangers of allopathic prescription drugs (the number one cause of death in the US) and surgery, isn't it? Give the Mediterranean Diet a try. Age Less - Live More - Love It! Key factors to Age Less are simple and easy to implement. Only 5 steps to stop physical decline, relieve stress - and restore health. Don't wait for dis-ease - fix stress today. Age Less, then Living more - stress free - is easy. Live a life you design in a healthy vital body - starting today. Age Less and Live More and it's easy to "Love It!" I’ve read, researched and taught over 40 years - and the "ONE Step and facts" here are a blending of ancient wisdom, Philosophy, and Science…plus my passion to figure out how to live a life of Good Fortune. Experience is reliable feedback. You may have lost a fortune - I have several times. That's a part of most success stories. But you don’t "loose" until you give up. I know how to create wealth and health, because I have several times – that’s how I uncovered the "One Step" that works. 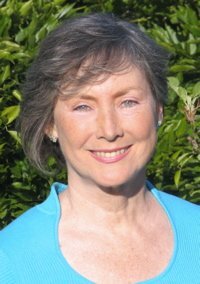 Over the past 10 years wealthy clients allowed me the freedom to write and create a guide to health and riches- You are reading it now. Instead of another e-book for sale, Quick-Good-Fortune is a website and all the basic information is free. Please support the resources you find here and use the links to visit affiliates and advertisers. With your help, the resources help to pay to maintain the site. The endless misfortune most experience -- and my friends seeking relief from cash problems or healing illness from stress-- inspired me to make these truths available. It’s fun to help the rich get richer, but now it is possible for anyone to break through misfortune and slips into the flow of Good Fortune!